This is a follow up to my previous article where I compared the Apple iPad with the recently announced ASUS EeePads. 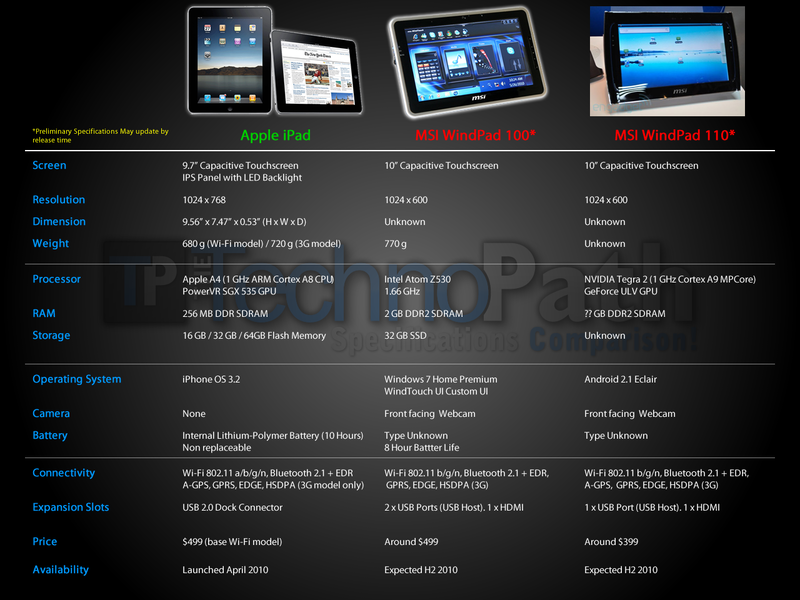 Both the EeePads from the previous article as well as the MSI WindPads were unveiled at Computex 2010 in Taipei. While MSI did reveal the Atom powered WindPad 100 at its press conference, the NVIDIA Tegra 2 powered WindPad 110 running Android didn’t receive much press buzz and was kept at a quiet corner of their booth. The technical specifications in this article come from a number of web sources including tech blogs like Engadget, as well as official press releases. Again I chose the iPad as the current benchmark, because right now it is the only dominating Tablet in the market. Like I said before, both the WindPads are 10 inch slates. The WindPad 100 is powered by an Intel Atom Z530 processor running at 1.66 GHz and 2GB of DDR2 RAM. 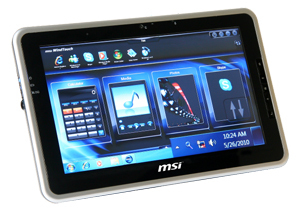 It is running Windows 7 Home Premium with a custom UI skin by MSI called the WindTouch UI. The WindPad 110 had aÂ strikinglyÂ different design than the WindPad 100, and is powered by NVIDIA Tegra 2 SoC and runs Android 2.1 Eclair. It is currently in very early prototype stages and one MSIÂ representativeÂ went as far as to say that it may never see the light of the day as a finished product. Preliminary specifications are subject to change and there is no clear indication of when the devices would ship. Apparently MSI maintains that the release would happen sometime this year. Personally I would prefer a late release over a half baked one. I’ll keep revising the details as they become available until the specifications are locked down and the devices hit the store shelves. I did a similar comparison of Apple iPad vs. Asus EeePad EP121 and EeePad Ep101TC. Ran 47 queries in 0.249 seconds.